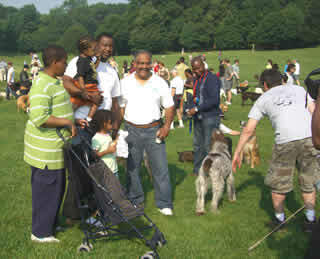 On June 7, 2008 hundreds of New York City park patrons gathered in Brooklyn's verdant Prospect Park to celebrate the one year anniversary of Off-leash Hours policy as official NYC Parks Department regulations. 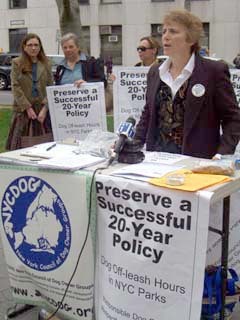 The 20+ year successful policy was saved and strengthened following a NYS Supreme Court victory in 2006, an amendment of the NYC Health Code "Leash Law" in 2006, and codification of limited Off-leash Hours in NYC Parks regulations in 2007. Parks Department Assistant Commissioner Kevin Jeffrey attended the celebration on behalf of the NYC Department of Parks & Recreation to thank responsible dog owners for continuing to make the Off-leash Hours policy successful in the 88+ parks where it now exists. Assistant Commissioner Jeffrey (pictured left center with white shirt and mustache) talks with a family in Prospect Park enjoying the Off-leash Hours celebration. 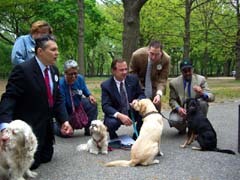 Assistant Parks Commissioner Jeffrey (second from right) and two Parks Enforcement Police (PEP) officers, together with members of NYCdog and FIDO of Prospect Park. Also pictured is Paula Van Meter (second from the left), the attorney who argued the 2006 NYS Supreme Court case successfully for the City. ..
Video clip of Assistant Commissioner Jeffrey praising responsible dog ownership and the Off-leash Hours policy. Remarks also from NYCdog President Bob Marino and FIDO President Tony Chiappelloni. Families and neighbors appreciate the opportunity to exercise and socialize their dogs early in the morning, keeping the parks safer, and strengthening community. 12-Month Effort Achieves a Legal Victory in NYS Supreme Court and a Public Health Victory from the NYC Health Board. 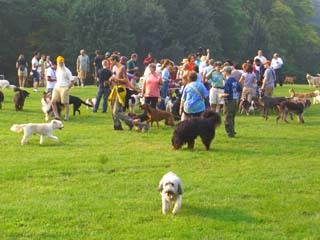 Off-leash Hours scenes like this one in Prospect Park were threatened by a lawsuit that sought to end the successful 20-year policy of limited hour off-leash recreation in certain sections of certain NYC parks. 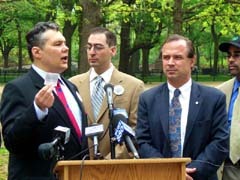 The lawsuit was rejected by a NYS Supreme Court judge on November 30, 2006. On April 10, 2007, the NYC Parks Department ratified amendments to their own regulations that codify the previously unwritten limited Off-leash Hours policy. On May 10, 2007, the regulations went into effect. (May 10, 2007, New York): The Parks Department adopted amendments to its own regulations known as the “leash law” goes into effect today. This ends the debate about the off-leash policy, and provides the third consecutive victory for NYCdog, which already won in State Supreme Court, and at the NYC Health Department. 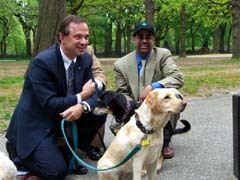 Background: After twenty years of this successful policy, a court decision affirming the Parks Commissioner’s powers to provide off-leash, and a unanimous Health Department regulatory clarification illustrating that off-leash is good public health policy, today the Parks Department adopted amendments to the “leash law” that clarify and strengthen the successful off-leash policy. Summary of Parks Dep’t Changes: The Parks Dep’t adopted amendments to Sections 1-04 (i) and 1-05(s)(3) of Title 56 of the RCNY. These amendments expressly codify times (9 pm until parks close / when they re-open until 9 am) and park places (never in a playground, zoo, bathing facility, beach, pool, bridle path, fountain, ballfield, basketball or tennis court, or other prohibited areas) where dogs are permitted off-leash. As a condition to being off-leash, dogs must wear NYC license and rabies vaccination tags. Moreover, off-leash dogs must not disturb, harass, or injure any park patron, animal, or flora. Lastly, owners must leash dogs when directed by police, health, or PEP officer. The regulation changes (Notice of Adoption) can be viewed here. Matthew H. Parker, President of Friends of Hillside Dog Park said, "Today's decision to clearly codify a 20 year old policy is the culmination of a year long effort that produced three huge wins. NYCdog is three for three in the fight to preserve and strengthen the off-leash policy. We accomplished these wins through the help of tens of thousands of everyday New Yorkers who volunteered to write letters, speak at the hearings, and submit signatures of their support. As the recognized umbrella organization of almost every off-leash user-group in the City, NYCdog looks forward to working with the Parks Dep’t to make the newly codified policy even more successful." Read the NYC Parks Department press release. Read the official regulation changes (Notice of Adoption). 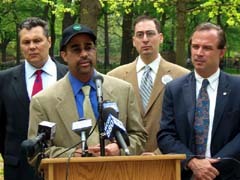 Watch video of the May 10, 2007 Parks Department press conference in Central Park. NYC Parks Department Commissioner Adrian Benepe speaks about the newly codified successful 20-year policy. 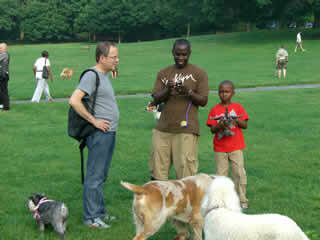 NYCdog President Bob Marino expresses thoughts on the policy and dog owners' responsibilities when using the parks. A Story with Three Acts. THE LAWSUIT: A judge ruled in favor of the City and the Parks Department in November 2006 and handed a resounding legal defeat to those who oppose the Limited Off-leash Hours Policy. Read more about the NYS Supreme Court case here. THE BOARD OF HEALTH: The NYC Board of Health proposed changes to the Health Code known as the "Leash Law." The Board accepted public comments and hosted a public hearing. In December 2006 the Board voted unanimously to pass the amendments which strengthen and clarify the limited Off-leash Hours policy. Read more about the Leash Law amendments here. THE PARKS DEPARTMENT: On February 22, 2007 the Parks Department held a public hearing for comment on their proposed amendments to codify the previously unwritten 20-year Off-leash Hours policy into Parks' regulations. Final Victory: On April 10th, 2007, the Parks Department announced a Notice of Adoption to its official regulations that codify an Off-leash Hours policy. Read the Parks Department's Notice of Adoption here. NYCdog Statement on the NYC Parks Department's Public Hearing for Regulation Amendments Concerning a Limited Off-Leash Hours Policy in Parks. 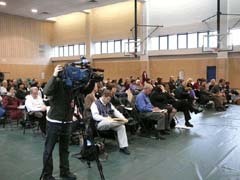 February 22, 2007, New York, NY: The New York Council of Dog Owner Groups (NYCdog.org) commends the NYC Parks Department for conducting a fair and orderly public hearing at the Chelsea Recreation Center in Manhattan. 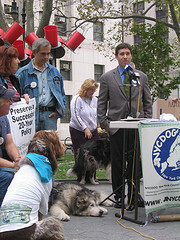 NYCdog presented over 20,000 letters and petition signatures from New Yorkers who support the limited Off-leash Hours. An hour before the hearing, NYCdog held a press conference outside of the Chelsea Recreation Center covered by Eyewitness News (ABC), NY1, the Daily News, New York Post, and several local Queens newspapers. This has been a dramatic and apprehensive year for supporters of the parks Off-leash Hours policy. 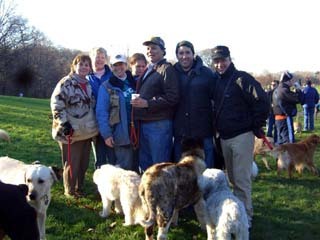 In May 2006, the Juniper Park Civic Association, the second largest civic association in Middle Village, Queens, sued the Parks Department and the City of New York contending that the Off-leash Hours policy violated the “Leash Law” provision of the Health Code, in an attempt to end the successful 20-year policy. Fortunately, the NYS Supreme Court denied the JPCA’s lawsuit on November 30, 2006, and ruled that the Off-leash Hours policy has always been and continues to be legal. Six days later, on December 5, 2006, the NYC Health Board voted unanimously to amend the “Leash Law” to explicitly grant the Parks commissioner authority to promulgate a limited Off-leash Hours policy in NYC parks. This action was, in part, to prevent further frivolous lawsuits against Off-leash Hours policy in the future. These two historic wins for the Off-leash Hours policy in November and December 2006 set the stage for today’s Parks Department public hearing. Today was the beginning of the third and final act of this year-long drama to save and strengthen the Off-leash Hours policy in New York City. Now that the hearing is over, the Parks Department will consider all written and spoken comments to their proposed regulation amendments. We expect the Parks Department to formally ratify the amendments within the next 30 days. Following that, the Parks Department will send the ratified amendments to the City’s corporation counsel for approval. Once approved, the ratified amendments will be published in the City Register and 30 days following that the amendments that formally codify the Off-leash Hours policy will become official NYC Parks regulations. We expect the whole process to be completed sometime in April 2007. While generally supportive of the Parks Departments proposed amendments, NYCdog submitted written comments and oral testimony at the hearing advising the Parks Department to change some wording of the amendments to avoid potential ambiguity which might lead to issues in the future. An interesting side story in this drama is the newly uncovered petition fraud on the Juniper Park Civic Association's anti off-leash petition website. This issue has been dubbed "PetitionGate." The JPCA's online petition hosting company, iPetitions, after many complaints from NYCdog and its member groups, removed over 4,000 names when the company confirmed that rather than individuals signing the online petition, one user entered phony names. The New York Post wrote an article about the petition fraud here. After nearly a year long fight in NYS Supreme Court, the NYC Board of Health, and now the Parks Department, off-leash advocates have proven that the Off-leash Hours policy is legal, good public health policy, and now the previously unwritten policy should be codified into Parks regulations, thereby assuring its continued existence and strengthening the policy to encourage responsible dog ownership. 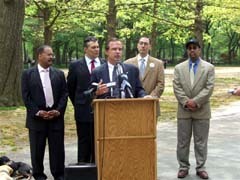 NYC Parks Commissioner Adrian Benepe speaks to the press on May 10, 2007 to announce the new Off-leash Hours Regulations are in effect. 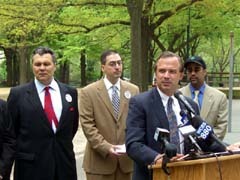 Bob Marino, NYCdog President, speaks to the news media at a press conference before the Parks hearing on new regulations for Off-leash Hours Policy. 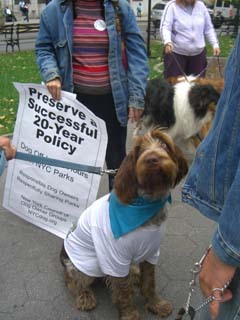 NYC Parks Dept representatives hold over 20,000 petition signatures submitted by NYCdog. Parveen Fahoody, a noted dog behaviorist and trainer speaks strongly in favor of the proposed Parks amendments. Susan Buckley, President of Central Park PAWS, delivers her comments to the Parks Department in favor of the proposed amendments to codify the 20-year Off-leash Hours policy. 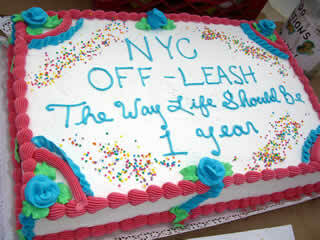 December 5 , 2006, New York, NY: The New York Council of Dog Owner Groups (NYCdog) cheers today’s NYC Health Board unanimous vote to amend Section 161.05 of the City Health Code commonly known at the "Leash Law." Today's Health Board vote grants the NYC Parks Commissioner explicit authority to permit off-leash recreation in the New York City parks at certain locations and at certain times. The amendments also put new requirements on dog owners who take advantage of the Off-leash Hours policy, thereby further encouraging responsible dog ownership. Today's vote comes just six days following a legal victory in New York State Supreme Court where Judge Peter J. Kelly ruled that by law the NYC Parks commissioner has discretionary authority over off-leash dogs in New York City parks. In his ruling, Judge Kelly encouraged the NYC Health and Parks Departments to modify their regulations to prevent future lawsuits and to better publicize the rules regarding off-leash recreation. The New York City Health Board took the first step as recommended by Judge Kelly to modify the Health Code to clarify the authority of the Parks commissioner and to stipulate that the NYC Parks Department must establish clear and well publicized rules regarding off-leash recreation. The New York City Parks Department is now expected to begin its own rule amendment process following a similar procedure as specified in the City Charter's City Administrative Procedures Act (CAPA). That process is expected to begin in January 2007 and run through February 2007. NYCdog looks forward to working with the Parks and Health Departments to promote responsible dog ownership in New York City. Comment from Health Commissioner Thomas Frieden: "The overwhelming majority of comments received on this proposal were in favor [13,268 in favor vs 202 against]. We have devised a rule that balances our mandate to protect the public’s health and safety with the need for a formal off-leash policy for dogs in City parks." Comment from Parks Commissioner Adrian Benepe: "The Parks Department looks forward to codifying the successful, long-standing "courtesy hours" policy. For the last two decades, this policy has allowed dog owners to exercise and socialize their pets in designated areas during certain hours. The daily presence of dog owners during early morning and late evening hours and fewer reports of dog bites have also made parks safer." Read NYCdog's press release here. Read the NYC Department of Health official press release here. Read the Leash Law amendments click here. View a summary of the public comments during the official comment period and Health Dept responses here. Read a transcript of the November 1, 2006 public hearing to amend Section 161.05 here. AM NY has an accurate article about the Health Board vote here. In May 2006, a small Queens civic association filed a lawsuit in State Supreme Court seeking to end the successful 20-year policy of allowing dogs off-leash during the limited hours of 9pm-closing, and opening to 9am in designated locations in NYC parks that don’t have a dog run. On August 29, 2006 the case was heard in State Supreme Court and the judge has said he would rule in the case. Typically, rulings are issued within 12 weeks of hearing oral argument. 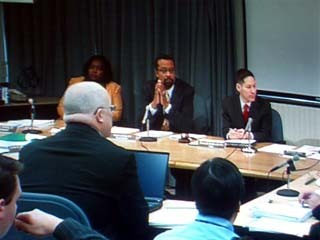 On November 1st, 2006 the NYC Health Board held a public hearing from 2pm-5pm at the Health Department at 125 Worth Street in Manhattan. The NYC Health Board is a group of public health professionals that work for the NYC Health Department who have the power to amend the City Health Code. Prior to the 2pm hearing, the New York Council of Dog Owner Groups (NYCdog.org) held a news conference in Foley Square Park, across the street from the Health Department. TV crews and reporters from NY1, CBS, NBC, FOX, UPN, Daily News, 1010WINS, and 880 WCBS Radio attended, in addition to several other smaller news outlets. 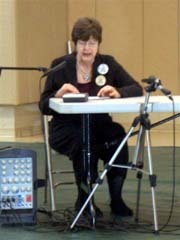 NY City Council Member Gale A. 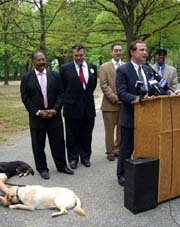 Brewer, among others, spoke at the NYCdog press conference strongly in favor of the proposed amendments. News coverage has been extensive and generally supportive of the amendments. Inside the Health Department 2nd floor auditorium, the Health Board brought the hearing to order at exactly 2pm. 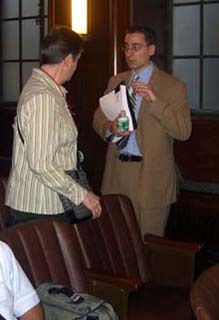 Health Department Commissioner Thomas Frieden, a supporter of the amendments, attended part of the hearing. A total of 39 speakers had a maximum of 5 minutes each to present oral testimony to the four members of the Health Board in attendance. The Board also accepted comments from the public in the form of emails, letters, and faxes up until 5pm on Nov. 1st. Thirty speakers were in favor of the proposed amendments. In general, the pro-offleash speakers could be categorized as either 1) representatives of dog owner groups, 2) public health professionals, 3) dog behavior experts, and 4) general members of the public who support the amendments. Representatives from the following organizations strongly supported the Health Department’s proposed amendments: the New York City Bar Association’s Committee on Legal Issues Pertaining to Animals, Friends of Animal Care and Control and the Veterinary Medical Association of New York City. Moreover, former Parks Commissioner Henry Stern spoke at the hearing. Alluding to the 9 PM to closing, and opening to 9 AM Off-leash policy that he initiated twenty years ago, Stern stated that the “allocation of space and time within the parks” for both dog-owners and non dog-owners represents “common sense”. Dog bite statistics are at an historic low, despite the fact that dog ownership is at a historic high level in NYC. (Prior to the off-leash policy, 40,000 bites occurred annually. Since the off-leash policy, less than 4,000 bites occur annually, and only 2.2% of them – exactly 86 – occurred in City parks in 2005). The presence and vigilance of dog owners provides an effective deterrent against crime in NYC parks during early morning and late evening hours. The off-leash policy generally makes parks safer for both dog-owners, and non dog-owners. Community bonds are strengthened by responsible dog-ownership, and friendships across all socio-economic lines are forged among dog-owners in many neighborhoods. Dogs are properly exercised and socialized, and as a result, are better adjusted for urban living. As many studies detail (click here to view the studies) a tired dog is a good dog, as dogs that are properly exercised and socialized are less aggressive. Utilizing designated park space during limited hours is necessary, since there are only 44 dog runs Citywide. More dog runs would be helpful, but, in addition to the high cost to build more dog runs, there is little space available to devote solely to dogs on a 24/7 basis. That is why the limited hours and designated locations within City parks is necessary, and why it presents an equitable policy that is good for both the dog-owning and non dog-owning public. Having rational, fact-based, and statistically-driven arguments from health care professionals, licensed veterinarians, licensed dog behaviorists, responsible dog owners, dog owner group spokespersons, and attorneys intimately familiar with the applicable Parks and Health regulations presented a clear and strong argument in favor of the Off-leash policy and the Health Department’s proposed amendments to the Health Board. Only nine people out of thirty-nine in total that testified at the hearing spoke against the amendments. Among those most represented opposing the amendments were board members of the Juniper Park Civic Association, the un-elected, private, rapidly dwindling and beleaguered civic organization in Middle Village, Queens. This is the same group that misguidedly brought the lawsuit to State Supreme Court in May because they misinterpreted the powers and duties of the Parks Commissioner. Perhaps they only read the Health Code, and didn’t bother to read the City Charter, or the Parks Department regulations? Prior to bringing the lawsuit, the JPCA rejected a dog run in Juniper Valley Park, which would have been the only off-leash area for dogs in the park. Instead, because the JPCA rejected both Off-leash Hours and a dog run in Juniper Valley Park, they chose to initiate a costly and frivolous lawsuit against City. NYCdog was expecting stronger arguments from the anti-amendment people. Instead, the infamous JPCA board members spent a significant amount of their allotted time haranguing the Health Board for even considering such an amendment to the Health Code. The JPCA board did their side of the debate a disservice at the Health hearing, but showed their true colors. They came across as illogical, shrill, pedantic, uncompromising, and some speakers a bit unhinged. The JPCA president, the lead instigator of the lawsuit that began this entire process, was particularly nasty to the Health Board and his arguments reflected his desperation. Ironically, thanks to their NYS Supreme Court defeat and the unanimous ratification of the Health Code amendments, the JPCA is the group most responsible for helping to clarify and strengthen the Off-leash policy. Their performance at the Health Board hearing illustrated frustration at their losing cause and chagrin at how badly their misguided lawsuit has backfired. The hearing was part of the approximately 90-day City Administrative Procedures Act (CAPA) process in an attempt to amend the Health Code. While the Health regulations state that animals must be restrained by a leash no more than six feet in length, Section 1-04 of the Parks regulations permits the Parks commissioner to allow animals off-leash in City parks. Additionally, chapter 21 of the City Charter empowers the Parks commissioner to establish and enforce Citywide rules and regulations for the use of public parks, which shall have the full force of law. The Parks Department's Off-leash policy in designated park locations and during limited times (9 pm to closing, and opening to 9 am) represents a reasonable accommodation for all park users, and has been successful and legal for 20 years. The Health Code (article 161.05) allows for discretionary enforcement of the "Leash Law" by the Parks Department, and the Parks regulations (section 1-04) clearly state that the Parks commissioner may allow dogs to be off-leash in city parks. This stems from the City Charter's mandate granted to the Parks commissioner (chapter 21), which allows the commissioner to issue and enforce rules and regulations regarding the use of parks that have the full force of law. In other words, the Parks commissioner can legally issue a 9 PM to park closing, and park opening to 9 AM off-leash policy within certain designated spaces. So, the current off-leash policy is quite legitimate, very much legal, and has been successful for 20 years Click here to view the NYCdog memorandum of law submitted to the State Supreme Court in August 2006 that details the legality of the Off-leash Hours policy. It should be noted that the Health hearing occurred on November 1st, 2006, over one month before the New York State Supreme Court denied the Juniper Park Civic Association's lawsuit attempting to end Off-leash Hours policy citywide. At that time it was not known if the Supreme Court would actually rule in the case, because the judge was aware that the Health Department was engaged in the process attempting to amend the "Leash Law" to explicitly grant the Parks commissioner authority for dogs off-leash in NYC parks. A successful Health Board vote would, in effect, render the court ruling moot. However, despite this, the judge did hand down his ruling on November 30th, six days before the Health Board voted in favor of the amendments. The City Administrative Procedures Act (CAPA) is a much faster, more streamlined, and clearer process than the sometimes onerous and much longer legislative process favored by some. The CAPA process is perfectly legitimate, and very democratic, as it openly solicits feedback from the public and allows for an open and public hearing on the issue. While NYCdog appreciates the support of many elected officials, this issue is one best left for the agencies involved – the Health and Parks Departments – and not partisan politicians solely seeking to generate publicity for themselves. The Health Board amended the Health Code in favor of Off-leash Hours policy and responsible dog ownership. This, plus the successful Supreme Court decision, provides a clear sign that the Off-leash Hours policy will be strengthened, and that the City will be protected against future misguided lawsuits. The Parks Department will initiate their own rule change to further clarify the Off-leash Hours policy. Such a rule change would follow the Health Board’s proposed amendments, which call for greater awareness among the public about the limited hours and designated locations of the Off-leash Hours policy. This will likely make things absolutely crystal clear, and insure that both dog owners and non dog owners alike understand the Off-leash Hours policy. THAT’S WHY WE’LL NEED YOUR HELP. The Parks Department will initiate their own CAPA process at the beginning of 2007, and we still need your support. Your voice can be heard on how to further improve the Off-leash Hours policy, and how to make sure that both the dog-owning and non dog-owning public can safely enjoy City parks. Denali, an Italian Spinone, appreciates his owner's strong support to continue the Offleash Hours policy that have helped Denali become a well-socialized dog. NYCdog supporters and their dogs from member group FIDO in Prospect Park at the noon press conference outside of the Department of Health. The 13-member NYC Health Board met on December 5, 2006 and unanimously amended the "Leash Law" to specifically grant the Parks commissioner authority to promulgate a limited Off-leash Hours policy in NYC parks. 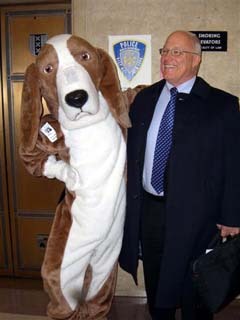 Dr. Edgar Butts, NYC Health Department Assistant Commissioner for Veterinary Services and Pest Control Services, and member of the NYC Health Board, poses with an Off-leash Hours policy supporter immediately following the unanimous Health Board vote. 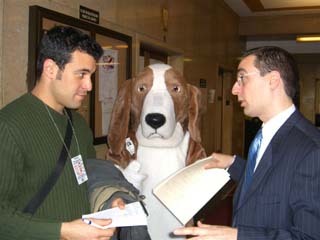 Matthew Greller (right), NYCdog attorney and strategy architect for Acts Two and Three: The Health and Parks Department CAPA processes, speaks to a news reporter at the NYC Department of Health during the historic December 5, 2006 Health Board vote to amend the City's "Leash Law." Part of the Dream Team that helped win in Acts One and Two celebrates the legal and Health Board victories during Prospect Park Off-Leash hours. (from the left) Paula Van Meter, NYC Corporate Counsel Attorney who represented the NYC Parks Dept and presented oral arguments to the NYS Supreme Court; Trudy Kawami, NYCdog Board Member; Mary McInerney, NYCdog V.P. ; Terri Sullivan, NYCdog Treasurer; Bob Marino, NYCdog President; Matthew H. Parker, NYCdog V.P./Secretary; Dr. Carmine Petracca, off-leash supporter. Not pictured: Matthew Greller, NYCdog attorney and advisor for the Health and Parks CAPA hearings, Andrew Otis and Dora Straus, NYCdog pro bono attorneys for the NYS Supreme Court case, and many others that make up the NYCdog group of constituents organizations who have worked tirelessly to preserve the Off-leash Hours policy in New York City. 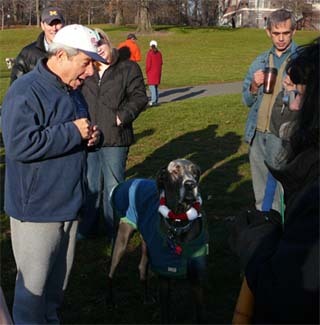 Brooklyn Borough President Marty Markowitz made a speech at a recent Prospect Park Coffee Bark function during Off-leash Hours the weekend following the amendment to the "Leash Law" Health Code. Tupper Thomas, President of the Prospect Park Alliance, celebrates during Off-leash Hours in Prospect Park's Long Meadow following the amendment to the Health Code and the NYS Supreme Court victory. Ms. Thomas is known as the "Godmother" of the NYC Off-leash Hours policy. 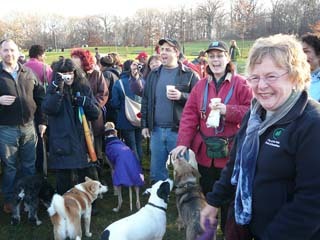 She, along with then Parks Commissioner Henry Stern, first instituted the Off-leash Hours policy in Prospect Park over twenty years ago. 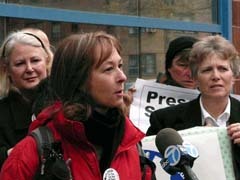 Mary McInerney, NYCdog V.P. 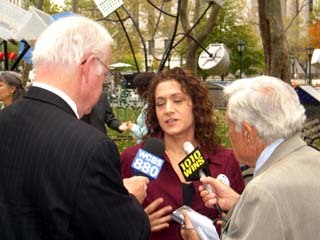 and President of FIDO in Prospect Park speaks to the press in front of the NYC Health Department building prior to the November 1, 2006 Health Board hearings. The hearing was to solicit public comments on the proposed amendments to the Health Code known as the "Leash Law" to clarify the Parks Commissioner's authority to permit Off-Leash Hours in NYC Parks. 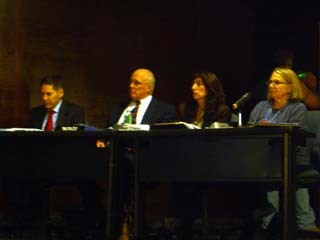 Members of the NYC Health Board, including Health Department Commissioner Tom Frieden (on the far left), listen to speakers at the public hearing held on November 1, 2006. The Health Board's favorable ruling on the proposed amendments strengthened and solidified the 20-year successful park Off-leash Hours policy. 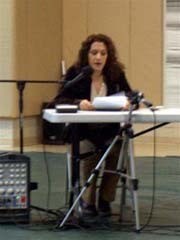 Terri Sullivan, NYCdog Board Member, and President of the 200-member Juniper Valley Park Dog Association in Queens gives her testimony in front of the NYC Health Board while a Health Department stenographer takes the record. 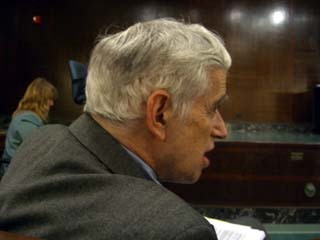 Former NYC Parks Commissioner Henry Stern provided his testimony at the Health Board hearing. Mr. Stern is the "Godfather" of the Off-leash Hours policy. The policy was first promulgated under his tenure and has been continued by two successive Parks Commissioners for twenty years. Strong support for the Off-leash Hours policy from three of most recent NYC Parks Commissioners. NYCdog President Bob Marino (right) talks to Dr. Carmine Petracca, an Off-leash supporter and hearing speaker, before the Health Board hearing began. Matthew H. Parker, NYCdog Board Member and President of Friends of Hillside Dog Park in Brooklyn speaks to the press surrounded by NYCdog supporters before the start of the Health Board hearing. Rissa Pickar, a member of the Marine Park Dog Owners Group, an informal organization of local residents that have recreated with their dogs during Offleash Hours in Brooklyn's Marine Park for many years speaks at the Health Board hearing. Parvene Farhoody, a noted animal behaviorist from Manhattan, is interviewed by the news media at the NYCdog press conference. Inside the Health Board hearing Ms. Farhoody spoke strongly in favor of preserving and strengthening the park Offleash Hours policy. Matthew Greller, NYCdog's attorney from the law firm of Blank, Rome speaks with an Off-leash Hours supporter from the Juniper Valley Park Dog Association before the hearing began. NYCdog wishes to thank Mr. Greller and Blank, Rome for their outstanding pro bono legal and advisement services throughout the lawsuit and the subsequent City Administrative Procedures Act process. NYCdog also greatly thanks Mr. Andrew Otis and Ms. Dora Straus from the Law Firm of Curtis, Mallet-Prevost, Colt & Mosle, LLP, the pro bono attorneys who drafted NYCdog's Memorandum of Law and who presented oral arguments in front of Judge Peter J. Kelly at State Supreme Court on Aug. 29, 2006. Thank you!!! 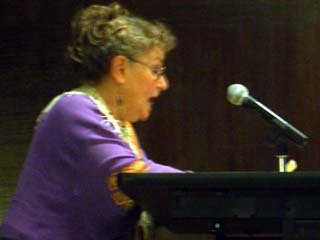 New York City Council Member Gale A. 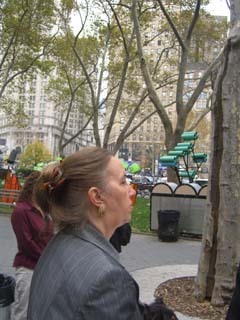 Brewer spoke in favor of the Health Code amendments at the NYCdog press conference in Foley Square Park, across the street from the Department of Health. 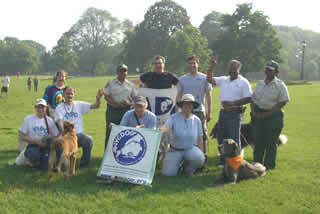 November 30, 2006, New York, NY: The New York Council of Dog Owner Groups (NYCdog) applauds today’s State Supreme Court ruling from Judge Peter J. Kelly denying the Juniper Park Civic Association’s lawsuit to compel the Parks Department and the City of New York to end the successful 20-year Off-leash policy (9 PM until parks close, and when they re-open until 9 am, only in certain designated Park spaces). This legal decision strongly affirms the position NYCdog has argued from the beginning— the Parks Commissioner has the legal authority to permit responsible off-leash recreation on a limited basis in New York City Parks. Today’s written decision also encourages the NYC Health Board to pass the Health Department’s proposed amendments to Section 161.05 of the Health Code (the “Leash Law”). The Health Board is expected to vote on the proposed amendments on December 5th to further clarify the existing regulations, encourage responsible dog ownership, and preserve the successful 20-year Parks limited Off-leash policy. NYCdog strongly supports the proposed Health Code amendments and encourages the Health Board to follow the Health Department’s recommendation to modify the existing regulation. NYCdog looks forward to working with the Parks and Health Department to promote responsible dog ownership in New York City. 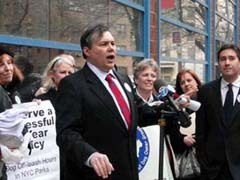 In May 2006, a small neighborhood civic association in Queens sued the City, the Parks Department and Park's Commissioner Adrian Benepe to end Parks' 20-year successful policy that permits dogs off-leash in certain areas of certain parks during limited hours. This has been commonly referred to as the "Off-leash Hours" or the "9-9 policy" since the hours of relaxed enforcement of the leash law are typically from 9pm until park close and then from when they re-open until 9am. This Off-leash Hours policy is a reasonable accommodation that allows the hundreds of thousands of City dog owners to exercise and socialize their dogs in the park off-leash. The policy started before the City's first dog park was built and continues because most neighborhoods do not have a dog park (also known as a dog run). In fact, fewer than 50 dog runs exist in the City, which has 1.4 million dogs. The Parks Department typically follows local Community Board advice on the construction of dog runs, as was recently the case in Marine Park, Brooklyn. Click here to learn why the 20-year offleash policy is good for New Yorkers. The Juniper Park Civic Association (JPCA) originally brought suit against the Parks Department in March 2006, but the judge refused to take the case. The JPCA then re-filed the case against Parks in May 2006, and that time the court granted an Order to Show Cause. If the lawsuit was ultimately successful (which it was not), the Off-leash Hours policy would have be eliminated. That would have meant an end to off-leash exercise and socialization in Central Park, Prospect Park, Ft. Greene Park,Stuyvesant Park, East Side Park, Marine Park and many other parks where dog owners rely on the parks to exercise and socialize their dogs. A New York State Supreme Court judge rejected the Juniper Park Civic Association's case on November 30, 2006. Contrary to the Juniper Park Civic Association's rhetoric about a crisis of dogs running wild in NYC parks, in reality, this lawsuit is really about power and who controls the parks. Juniper Valley Park is a magnificent 55 acre park, which belongs to all New Yorkers, and run by the Parks Department, since it was paid for, primarily maintained and improved by the Parks Dept, spending city taxpayer money, to the tune of $8.8 million dollars budgeted since 1996. But the president of the JPCA doesn't see it that way. From his perspective, Juniper Valley is HIS park, and he wants to control it. The JPCA's vitriolic statements against Commissioner Benepe stem from the commissioner's reluctance to give the JPCA carte blanche to control Juniper Valley Park. The kernel of this lawsuit is Commissioner Benepe's power as Parks commissioner to apply the rules uniformly across all NYC parks; in this case a choice to the Middle Village community to retain Off-leash Hours policy as it now exists or build a dog park in Juniper Park since there's a sizable constituency of taxpayers in the neighborhood who like to recreate in the local park with their dogs offleash, as can all other New York City residents. The JPCA postures that they are "being held hostage" by a Parks commissioner who is tyrannizing the community by forcing dogs off-leash in Juniper Park. The JPCA doesn't want either limited Off-leash Hours or a dog park in Juniper Valley Park. The JPCA president was quoted in the New York Times in April 2006 when asked about a dog park in Juniper Park saying, ''Tell me why our park has to be turned into a dog toilet." The JPCA president is determined to force power from the Parks Dept. to the local Community Board (where, somewhat coincidentally, the JPCA president also happens to be the vice chairman and believes he can control what goes on at the Community Board level.). If the JPCA is successful in their lawsuit it would mean an end to the limited Off-leash Hours policy citywide, as well as no dog park in Juniper Valley Park. The 200+ dog owners of the Juniper Park Dog Association would be defeated and not have a location in Juniper Valley Park to exercise and socialize their dogs off-leash. Ironically, just three years ago the JPCA honored Commissioner Benepe with the "2003 Community Service Award" possibly because Parks spent $1,800,000 renovating the ball fields in Juniper Park. Coincidentally, the President of the JPCA coaches baseball teams which use the new facilities. It all seemed pretty chummy. Formerly a JPCA award winner, Commissioner Benepe is now one of the JPCA's adversaries because he's telling the JPCA they need to accommodate the 200+ members of the Juniper Park Dog Association who wish to have either a dog park or Off-leash Hours in the park. It's clear that the private and un-elected Juniper Park Civic Association isn't interested in accommodating the needs of a significant number of Middle Village residents. At a recent meeting, a JPCA member who favors either Off-leash Hours or a dog park in Juniper Park was told to "shut up." 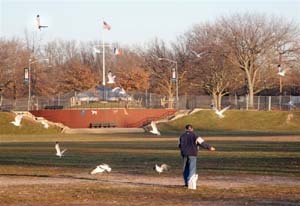 By filing the lawsuit, the president of the JPCA is vindictive enough to try to take down a successful 20-year Off-leash Hours Policy that benefits hundreds of thousands of people in the five boroughs of New York City in his effort to teach Commissioner Benepe and anyone else a lesson about what will happen in "his" park. Quite hypocritically, though the JPCA claims there's such a crisis of dogs running wild off-leash and the reason the JPCA filed this lawsuit is to help save their fellow New Yorkers citywide, a recent JPCA press release states that the JPCA was willing to drop their lawsuit if Commissioner Benepe cedes his authority to build a dog park in Juniper Park to the local Community Board (of which the JPCA president is vice chairman, and which the dog park would most certainly be defeated, leaving Middle Village dog owners out of luck in Juniper Valley Park.). It has also been rumored that the president of the JPCA has political ambitions for elected office. He could also be using this issue and the lawsuit to flex political muscle and generate publicity for self-aggrandizement, possibly hoping to achieve what he would consider a political "victory" that could be bandied about to garner votes in a future election, perhaps for City Council. Juniper Valley Park in Middle Village, Queens. The Juniper Park Civic Association said NO to a dog park and Off-leash Hours in the park, then unsuccessfully sued the Parks Department to end Off-leash Hours policy Citywide. 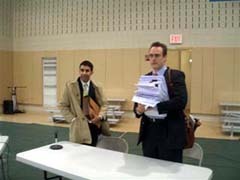 November 30, 2006: Judge Kelly rules against the Juniper Park Civic Association. In his written decision, Judge Kelly says that the JPCA president exhibits a "fundamental misunderstanding of the 'laws' at issue." The judge rules that the Parks Commissioner, under existing laws and regulations, has discretionary authority to permit dog offleash recreation in New York City Parks in certain areas and at certain times. The judge further encourages the NYC Department of Health and Department of Parks to amend their regulations to avoid future lawsuits and to clarify the Off-leash Hour policy. Heeding Judge Kelly's words, six days later on December 5th, 2006, the NYC Health Board votes unanimously to amend Section 161.05 of the NYC Health Code (the "Leash Law") to explicitly grant the Parks commissioner authority to permit limited Off-leash Hours policy in New York City Parks. 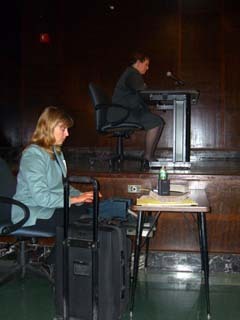 August 29, 2006: Judge Kelly heard oral arguments. NYCdog made a cross motion to intervene on the side of the Parks Department. 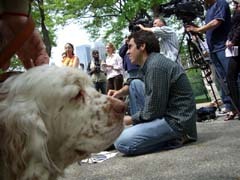 NYCdog holds a press conference on the steps of State Supreme Court in Queens. Attorney for the City said in court that the City would immediately begin a process seeking to amend the "Leash Law" to eliminate any confusion between the Health Dept. and the Parks Dept. 's 20-year Offleash Hours policy. Judge Kelly closed the hearing and said to expect a ruling. Download a debrief of what occurred at the court. August 8, 2006: JPCA press release claims to have attempted compromise as Judge Kelly had requested. Though previously claiming that this lawsuit case is not a local issue and the JPCA was seeking to eliminate Offleash Hours because it is a citywide problem and crisis of critical importance to all New Yorkers, the writer of this JPCA release says the group was willing to drop the citywide offleash lawsuit if the question of dog parks and off-leash in Juniper Valley Park would be put in front of the local Community Board (which, of course, consists of many JPCA members, virtually ensuring rejection of both a dog park in Juniper Park and offleash). 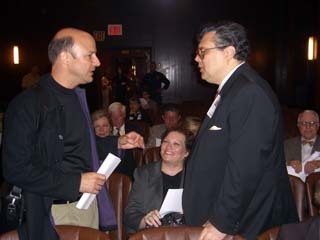 June 27, 2006: State Supreme Court Judge Peter Kelly meets with attorneys from the JPCA and Parks Department in chambers. Judge tells both sides that neither side wants him to rule in this case and encourages both sides to find a compromise. The judge does not accept NYCdog's Amicus Curiae "friend of the court" brief, but says he would if the case moves forward. Sets next court date for August 29. May 31, 2006: JPCA resubmits suit and obtains an Order to Show Cause in State Supreme Court. March/April 2006: JPCA attempts to start an Article 78 proceeding. Article 78 proceedings are generally used to compel a governmental body to do what it is required to do or refrain from what it is not supposed to do or from acting in an arbitrary and capricious manner. The attempt was rejected by State Supreme Court Judge Peter Kelly without prejudice to permitting another future attempt to start a proceeding, but with a requirement that the JPCA file a memorandum of law setting forth the reasons they believe the relief they are seeking in the proceeding is permitted in an Article 78 proceeding. 1999: JPCA press release. This is the earliest known public document indicating the JPCA's hostile intentions toward Offleash Hours in NYC parks. 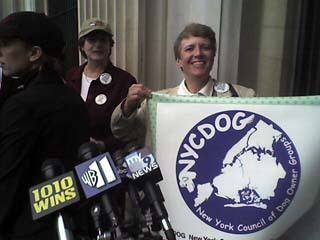 NYCdog members on the steps of the State Supreme Court, Queens County on Aug. 29, 2006 give a press conference while Judge Kelly hears oral arguments inside the courthouse. 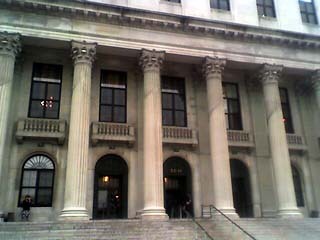 State Supreme Court in Jamaica, Queens where on Aug. 29, 2006 Judge Peter J. Kelly heard oral arguments in the case of Juniper Park Civic Association v. The City of New York, Adrian Benepe, Commissioner of The New York City Department of Parks and Recreation, and the New York City Department of Parks and Recreation.